Adoption FAQ: Do I Need Consent from the Biological Father to Make an Adoption Plan? Unplanned pregnancy often brings about many questions for expectant and birth mothers. Some of the most commonly asked questions we hear at Adoptions With Love relate to the biological father – his rights, his involvement, his consent in making an adoption plan. As an expectant/birth mother, you too may be wondering, ‘Do I need consent from the biological father to make an adoption plan?’, ‘Should he be involved in this process?’, or perhaps, ‘What is the father’s role in all of this?’ What if you do not have a relationship with the baby’s father at all? Every situation is unique. Right now, you may or may not be in contact with the biological father. You may or may not have a good relationship with him. Perhaps you do not know where, or who, the baby’s father is. This is okay. When you work with a trustworthy adoption agency, you can always feel safe and confident as you move through the adoption process, even if and when the biological father gets involved. You will also have a good understanding of the biological father’s rights in your state. You see, adoption and biological father consent laws vary state to state. Depending on where you live, the biological father may or may not need to know about your adoption plan. If the father is known, he may be required to establish paternity (i.e. prove his fatherhood) if he wishes to be involved with your decision. If he does not establish paternity, or waits too long to do so, he may not have any say in the adoption. Some states require that the father of the child be legally married to the mother in order to have any parental rights. Some states require a biological father to be made aware of his rights and responsibilities, if he is known. If the biological father is unknown, unaware, or unsupportive, some states will allow you to pursue the adoption without his involvement. You can learn about the adoption laws and birth father rights of your state by contacting Adoptions With Love. The legal assistance we provide to expectant/birth parents is always free of charge. If you have a safe and sound relationship with the biological father of your baby, we encourage you to talk to him about your pregnancy and interest in adoption. You may find that, in your situation, he becomes a great source of emotional support. In fact, you may discover that he wants to go through this journey with you. At Adoptions With Love, 80 percent of birth fathers are involved – on some level – in making an adoption plan. They have supported this positive choice and signed the legal documents allowing the adoption. If this is not your situation, that is completely okay, too. You always have support available, whenever you need it, at Adoptions With Love. Our caring staff is here to help you day or night, with free counseling services as needed. You are not alone. If you are unsure of how to tell the biological father the news, try to think of it as an educational process. You can help him understand the positive benefits of adoption, and explain to him how you arrived at this decision. If he is involved in the adoption, he can always opt for a different adoption plan than you. He may desire only a semi-open relationship with an adoptive family, while you decide on a fully open adoption. Or, he may not wish for any contact at all. This is okay. Each expectant parent gets to define their relationship with their child and with the adoptive family, on an individual basis. If the biological father is on board with the adoption plan, he is also entitled to free support and counseling at Adoptions With Love. He will likely have many of his own complicated emotions surrounding the adoption and pregnancy, which we can help him work through, as well. Should a biological father disagree with the adoption plan, he must be fully prepared to establish paternal rights in court, as well as take care of you and the baby, both emotionally and financially, for many years to come. If he is ready commit to a child, he must also be willing to commit to child support. Some expectant/birth mothers may not be in contact with the biological father or may not feel safe contacting him. If this is your situation, Adoptions With Love can step in and make contact as needed. Our professional team can contact him through a licensed adoption attorney. We will present him with his legal rights as a father, and work to get those rights relinquished so that you can move forward with the adoption plan. You do not have to have any direct contact with the biological father at all. Adoptions With Love has the experience and professional wherewithal to handle all kinds of circumstances. We also have the appropriate legal resources to terminate parental rights as needed. Should you ever feel uncomfortable regarding contact with the birth father, Adoptions With Love can handle it. We do not want a birth mother to feel stressed about this situation during her pregnancy. Should an expectant/birth mother not know who the birth father is, that is completely okay, too. We will walk you through the adoption process and be a shoulder to lean on along the way. We will also help you understand your state’s adoption laws in this type of situation. Whether you have a relationship with the biological father, do not have any contact with him, or simply do not know who he is, you can always find support, respect, and advice at Adoptions With Love. You should never feel pressured into a decision – even by the biological father. Remember that this is your decision. As an expectant/birth mother, only you know what is best for your baby. Adoptions With Love can help you, no matter the circumstance, with sensitivity, support, and zero judgment. 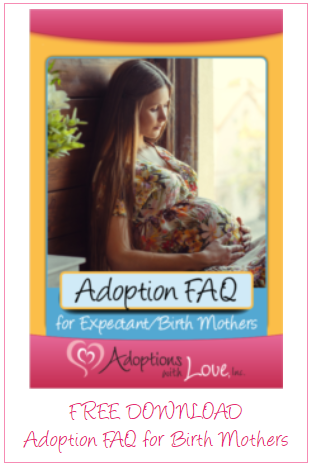 For even more answers and information about adoption and birth father rights, please download our free eBook, “Adoption FAQ for Birth Mothers.” You may also call us toll-free at 800-722-7731 or text us confidentially at 617-777-0072. We are available anytime of day, any day of the week to answer your call.